OneUSG is a systemwide initiative to develop and implement a consistent approach to policies, procedures and technology solutions that benefit the University System of Georgia (USG), in an effort to reduce costs, streamline processes, and have uniform guidelines with centralized support. The first priority for the OneUSG initiative is to bring all institutions onto one system to manage USG human resources activities, benefits and compensation by 2020. OneUSG Connect is an application that is intended to help an organization manage and maintain its workforce. The major components OneUSG Connect – payroll services, human resources management, time and attendance, and benefits administration – are unified and integrated into a single system. 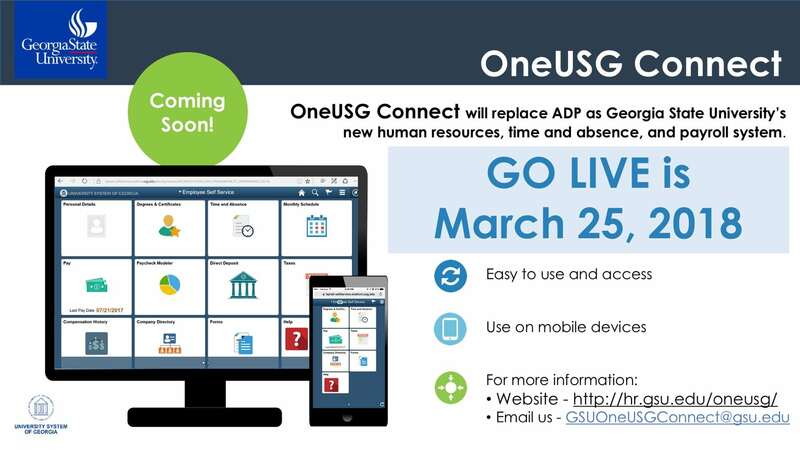 Georgia State implemented OneUSG Connect on March 25, 2018. We replaced ADP at that time and all employees now use the system to record and submit time, absences and to access, review and update personal information including direct deposit, paystubs and benefits. It allows for Single Sign-On (SSO) using GSU credentials eliminating the need to remember a separate username and password. Eliminates current java issues with ADP time approval. Did You Know This About Personal Information and Access in OneUSG Connect? Did You Know This About Time and Absence in OneUSG Connect?